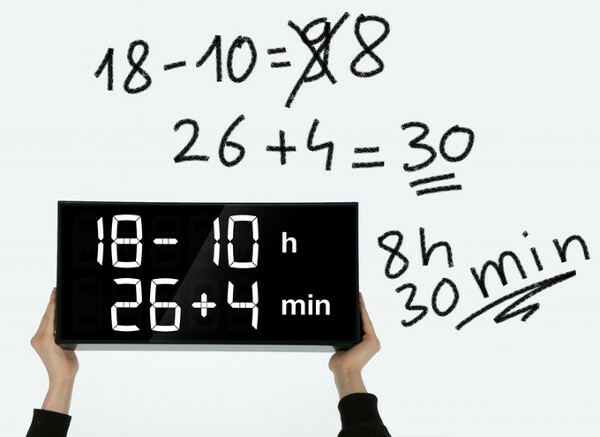 This ingenious digital wall clock can teach time and maths with just a glance and a thought. Perfect for teaching kids, but also for adults who want to keep their minds sharp. When you glance at the Albert Clock you know it’s time to get thinking! Instead of the conventional digital clock display, the Albert Clock shows the time in two sums: one for the hour and one for the minutes. Solve the puzzle and find the time. But don’t freak out if you are not a total math-head, the Albert Clock has different difficulty settings to meet everyone’s learning level. You can also set how often the equations change with once a minute being the most frequent. As your family gets quicker at solving you can increase the difficulty to keep it challenging. The fabulous benefit of this innovative clock is in the way it exercises our brains. We are often told that the brain is like a muscle – it needs regular workouts to keep fit. “If you don’t use it, you lose it” is the catchphrase of the neuroscientist. With the Albert Clock you can keep your family mentally fit while also having fun! The Albert Clock is set to hit the market in January 2016 with an estimated price of US$270. However, you can get the jump on this great product by pledging to the Kickstarter campaign now running to raise funds for production. Check out the video for more details and keep reading for pledge prizes. A pledge of US$160 or more to the Albert Clock Kickstarter will secure you one of the very first Albert clocks to be shipped out. But for a pledge of a mealsy €1 or more you can get the Albert clock app on your phone from November 2015.